The following Sea Eagle 380 review was written by one of favorite customers. Take a look. Sea Eagle 380x is one of the top of the line kayak’s produced by sea eagle, and is one of the most versatile kayak’s offered by them. 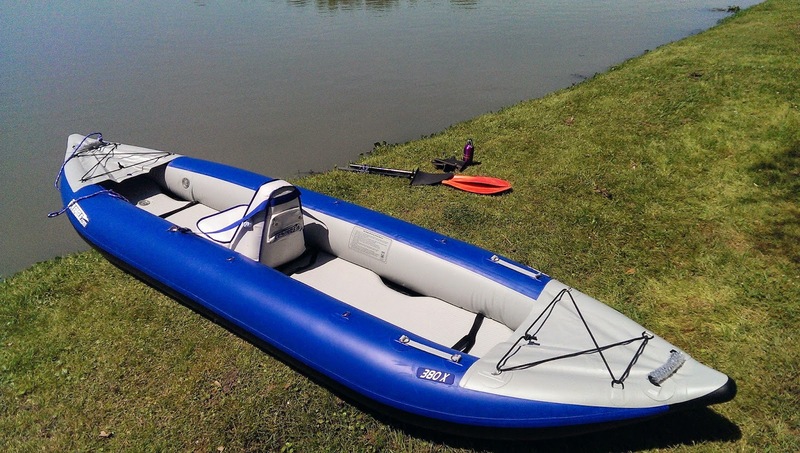 One can handle white-water, open-water easily with this 12 foot long and 3 foot wide (approximately) kayak. Let us start with set-up & dis-assembly and let me start by saying it is easy. I have used the leg pump that came with it and it is a breeze. I timed the setup to be 30 mins, from the minute of unloading the boat from car to getting into water. Dis-assembly, with cleaning took about the same time or little less. I am 6.1, and reasonably fit and I did not break sweat setting it up in 80F Louisiana heat. Ready..set..go ! Maiden voyage on LSU lakes ! It is made with a 1000 denier reinforced material ( a kind of PVC ), and is really tough. Sea eagle has a video out there where they abuse this kayak ( inflated ), with a Jeep, a claw hammer among other things, and it came out fine. They consider the material to be as tough as a crocodile-hide, and I may believe it. Look at what it can take !! In my experience, it is very tough and had withstood reasonable amount of abuse by scraping against submerged branches and cypress knees on the swamp I visited. I looked for scratches once back out of water, but glad to found none. One of my concerns is that I may end up getting stuck due to the long skeg on the back, but luckily I didn’t. About the only thing that happened is I happened to drag some vegetation with the skeg, until choppy water dislodged it after little while. For record, it tracks very well as-long-as there is no wind. The bow & stern edge’s of the kayak, has tough plastic snot’s, which helps bounce from anything the boat may bump against without giving in. The flooring can be inflated to up to 14.2 psi according to sea eagle, but I inflate it to the point where it feels tough like a hard carpet floor at home. I have not noticed any drop in pressure, in-spite of several abrasions against submerged branches & hours on water. On a Intex Mariner I owned in past, there is significant drop in floor pressure over hours. It is a roomy boat for sure, and hardly feels congested. There is plenty of vertical space, thanks to its 12 foot frame, and that space is only augmented by the 3 foot wide horizontal space through the boat. While on water, it feels like a tank and unfortunately steers like one. It is hard to turn, and requires repeated semi-circle sweeps, to turn than other kayak’s I owned. I find it effective to do a forward paddle on the opposing side to the direction you want to turn as effective way to turn. This boat by any means does not allow a fast paddle. It is slow and paddle occasionally rubs against the gunwales / side tubes. It is slow, and can be easily affected by wind. So stay clear of open-water, if you are paddling light. Fully loaded, it maybe easier to paddle due to the additional weight grounding the boat, and making it harder for wind to affect it. I would call it a “cruiser” of inflatable boats. Being a white-water paddling ready boat, this one has 16 drain valves which need to be closed before the first use in lake’s or river’s. I however did not have the opportunity to personally review how well the boat handles in white-water’s yet, and it maybe little while before I venture out into that. But online there are ton of other video’s showing just that, if that is your cup of coffee. The motor-mount option enhances your experience enabling you to hook a trolling motor to wade through open-water with relative ease and makes this a great fishing or touring platform. Finally a inflatable kayak that doubles as fishing canoe without having to buy yet an other boat ! Overall, I am satisfied & happy with this boat. I previously tried 2 sea eagle boats, 2 hard shell kayaks, 1 Intex boat, 1 Siemens boat and I can gladly say I finally found my ride. My goal is to explore water-bodies around where I live, with a relatively stable & safe platform which won’t break my back with tedious loading & unloading on top of my SUV. In addition it is idle for people with limited living spaces, considering how easily it folds back into a medium sized bag and will easily fit in the trunk of a sedan or coupe ! I like to add about my recent struggles padding the 380X in a bayou (connecting to Tickfaw River) with a bunch of sub-merged tree branches, logs, and other naturally occurring debris. Even though with great struggle, moving forward and backward, rocking the boat side ways, and getting dirty sometimes I managed to free myself from getting stuck the experience highlighted the struggles the longer skeg provided with this boat causes in shallow waters. So be prepared to be stuck if you are going to use a skeg in such waters or take the skeg out before you put it in. Alternatively, you can probably order their short skeg, or cut your skeg yourself. 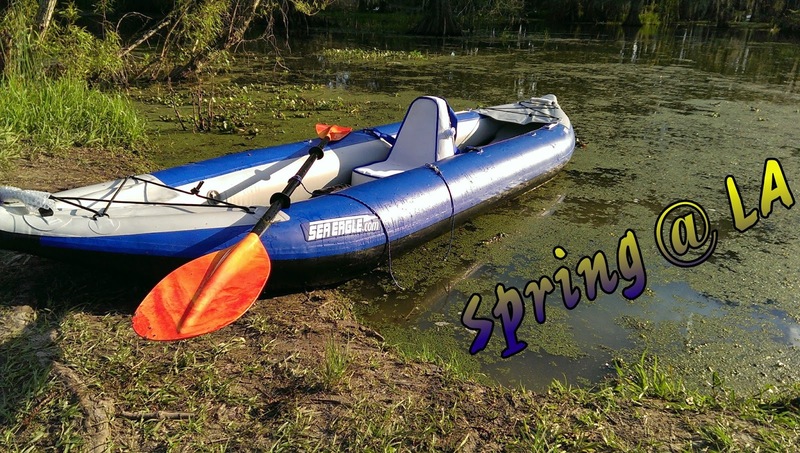 inflatableboats4less – I bought from here. Sweet deal !